Not everyone knows how to parent gently. Not everyone had the privilege of being raised in a home where gentle parenting was important. In fact, many people weren’t. Most people have stories to tell at some point in their growing up of a time when adults treated them in a less than compassionate way. Unfortunately, in the not to distant past, children were seen as a detriment to society and were not treated with kindness or respect. There was a common misbelief (and still is today) that gentle parenting is permissive parenting. It’s not! If you were raised in a home where gentle parenting was non-existent, then you may struggle as you try to raise your own children under a gentle parenting model. What implications does that have on your parenting today? Does it mean that if you weren’t treated gently as a child then you won’t know how to raise your own children with love and compassion? Just because you may not have been raised in an ideal situation, does not mean that you can’t become what you never knew! You can be an amazing parent, despite the worst circumstances you may have been raised in. The key is that you must choose to be different. It really becomes a mindset shift that definitely takes a concentrated effort, since not parenting gently may be all you ever knew as a child. Just like anything else, parenting can be studied as well. You may need to educate yourself to understand what the gentle parenting model actually looks like. Reading books such as Unconditional Respect can be essential for teaching you how to become a gentle parent. Of course, the internet also has tons of resources and you could spend countless hours learning how to parent differently than you were raised. Can You Find Anything Your Parents Did Well? Is there anything your parents did that you we’re thankful for or could copy in your own parenting? 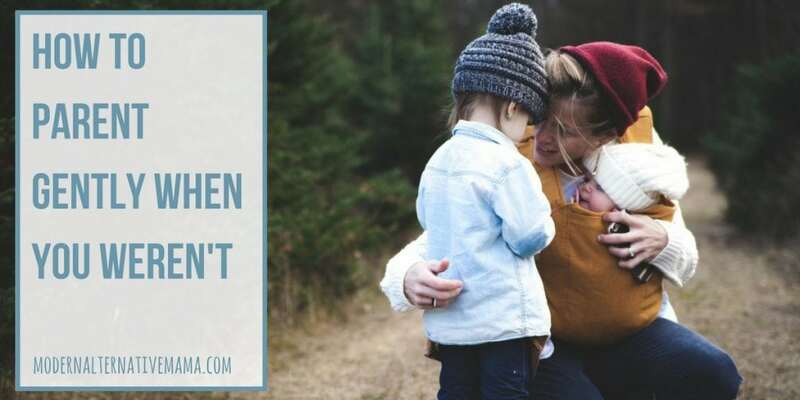 More than likely, if you weren’t parented gently, then you might have to dig deep into your heart to find some memories that resonate with you. But the truth is, even the worst parent usually has something they did right. Was your mom a good cook? Did your dad give you any advice? I realize, this might be a difficult exercise for you, but I would challenge you to take the time to truly think and see if there’s anything you can find that your parents did well. What Do You Want to Do Differently Than Your Parents Did? Of course, you will probably have a running list of things you would like to do differently in your own parenting. And you know what? That’s not a bad motivator! Use the things your parents didn’t do in your own childhood to parent your own kids in a gentle manner. What Ways Were You Hurt By Your Parents as a Child? If your parents hurt you when you were growing up, either physically, or emotionally, then use the hurts you experienced as a motivator to never hurt your kids in the same way and in essence, become more compassionate as a parent. Let those emotional scars be used as a reminder not to do the same things to your children. It would be very easy for you to follow in the same pattern, but you don’t have to! If the relationship allows, continuing to work on the relationship you have with your parents may very well be healing for you and helpful for your own parenting relationship. As you work through the resentment that comes from not having been parented gently, it will be helpful to treat your own kids with love, care, compassion, and understanding. Is there someone in your life who you think does a good job of parenting gently? Begin to copy what he or she does as a parent. This is especially important if you weren’t parented gently as a child. Finding a good role model might be exactly what you need to start parenting your kids in a gentle way. Typically speaking, if you weren’t parented in a gentle way, then you probably have brought some bad habits into your own parenting. If either of your parents lost their temper quickly, then you may struggle with that as well. I understand, that this may not always be the case, but you get the picture! Work hard to break your own bad habits with your kids and change one thing at a time. Understand that it will take time for you to become a gentle parent. Especially when you may not have known that as a child. When you fail, and you will, give yourself permission to start over again and don’t give up! Let’s face it! Kids know how to press each and every button. If you already struggle with not having had a good role model as you were growing up, then the chances are that your kids may know exactly how to frustrate you. Keep a good understanding that your kids are really not trying to destroy your life! Remember that your kids are just kids. They won’t stay that way forever! Then it will be easier to parent gently even if you weren’t. Perhaps, the most important thing you can do to parent gently even if you weren’t, is to connect with your children. Why? Because when you really connect with your kids, you love them for who they are. It will be much easier to become a gentle parent. Instead of resenting your kids, you will develop lasting relationships that run deep. Do you have a teenager you can’t relate to? Work on the relationship! Do you struggle with your toddler? Find a way to connect! Perhaps that was the connection that was missing between you and your parents when you were growing up. Use the knowledge of what your parents may not have done right to motivate you to become a better parent yourself! Were you raised in a house that didn’t know what gentle parenting was? What ways have you found to implement gentle parenting as you raise your kids?